Behind every successful man there’s a strong woman. That’s one of those adages with more than a ring of truth to it. Such is the case with JR and Loren Ridinger. As a young couple, the Ridingers founded Market America, working out of their garage. 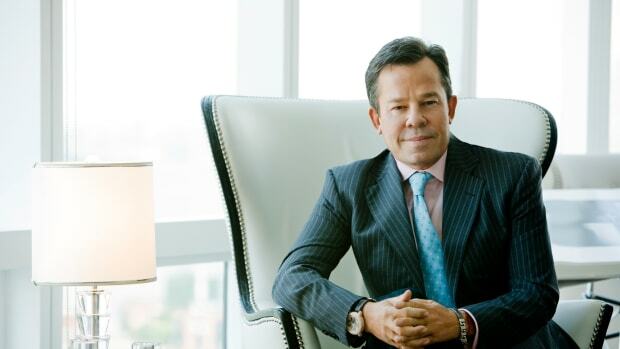 Today the product brokerage and online marketing company is a global enterprise, and the Ridingers are multimillionaires, living the American dream with a string of fashionable homes and a stable of luxury cars. 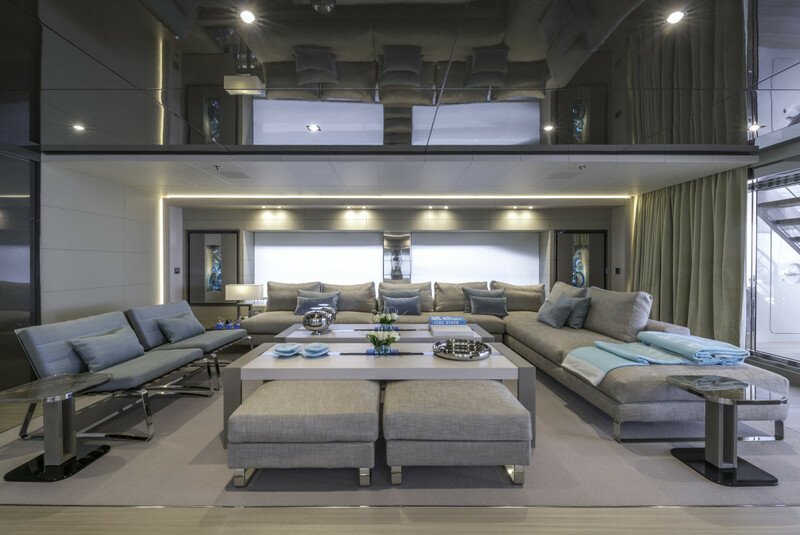 They are also veteran yacht owners who, earlier this year, took delivery of Utopia IV, a 206-foot (63-meter) trideck designed by Enrico Gobbi and built by Rossinavi in Italy. But if Loren hadn’t taken matters into her own hands, Utopia IV may never have happened. Utopia IV’s muscular exterior profile by Enrico Gobbi borrows styling motifs from the world of automotive design. The couple already owned Utopia III, a 150-foot (45.7-meter) Trinity that had served them well as a family boat and corporate success symbol. But with growing grandchildren, they felt it was time to take the next step up in size. 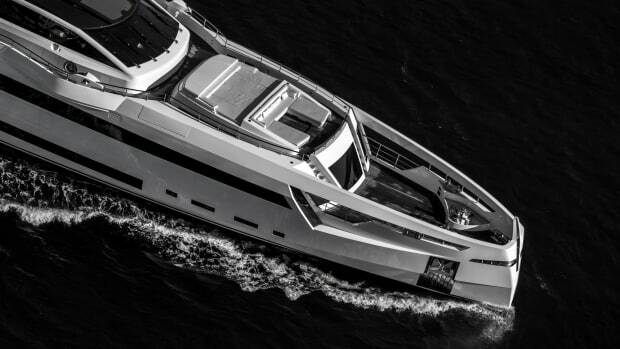 After two years of searching for a brokerage boat, they floated the idea of a custom yacht. 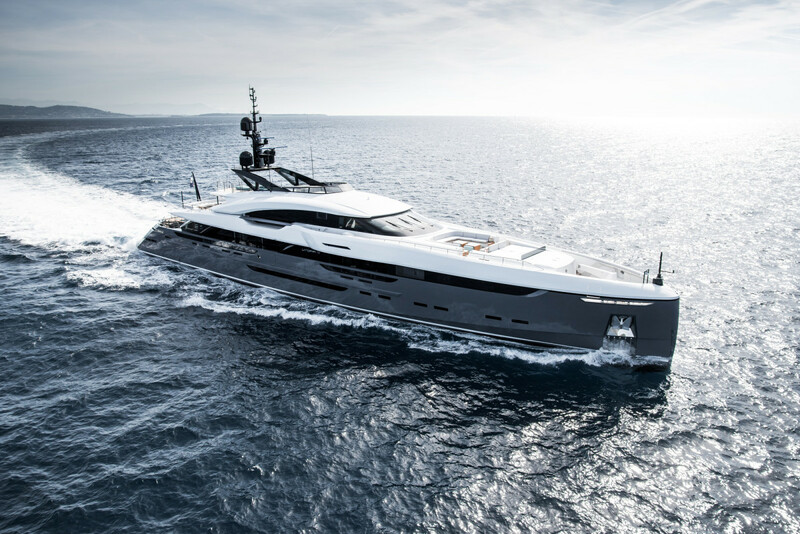 Project Vector, already in build at the Rossinavi yard, seemed to fit the bill, but JR was leery of signing on the dotted line. Loren knew he had reservations—but also that he really wanted the boat. “It was really about creating a warm environment to enjoy with our children and grandchildren, but also an amazing place where we could entertain and do business,” says Loren, who worked closely with Gobbi to define a cozily contemporary interior with a touch of Italian sophistication. Dark walnut combined with light oak and leather finishes in shades of ivory and beige create a crisp yet calming ambience. The textiles and fabrics are sourced from Hermès and Armani in soft, neutral tones with splashes of sailorly blue and vibrant aquamarine. 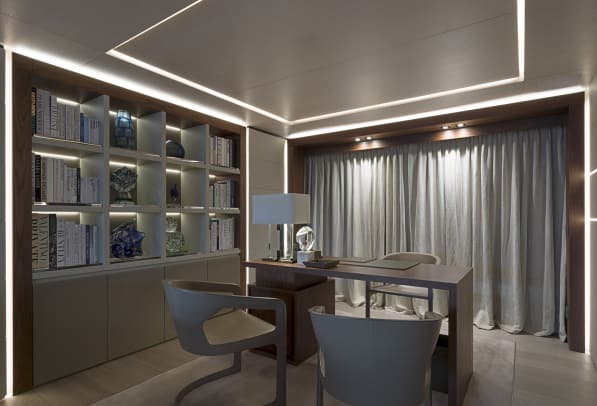 Diffuse LED-strip lighting on the ceilings and walls echoes the wooden louvers of the window blinds and enhances the calming mood. Loren Ridinger worked closely with Gobbi to define a cozily contemporary interior with a touch of Italian sophistication. The owners commissioned several bespoke artworks, including handcrafted pieces of Venetian glass and a cascading sculpture in the main lobby. The sculpture incorporates the names of the extended Ridinger family—a sort of DNA helix by Enrico Benetta, an Italian artist known for his typographical creations. 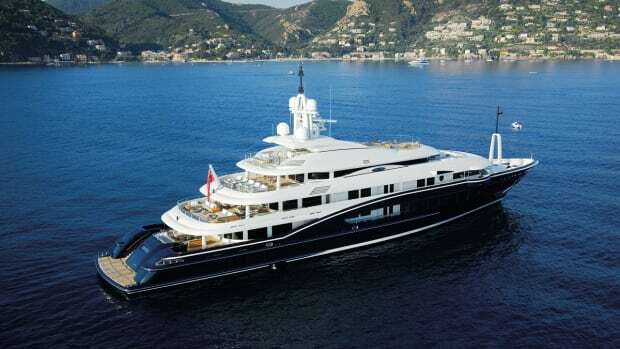 The master suite on the main deck forward has a king-size bed on a raised platform facing a glass-walled hot tub that can be closed off by wraparound curtains, and a private terrace built into the starboard bulwark. 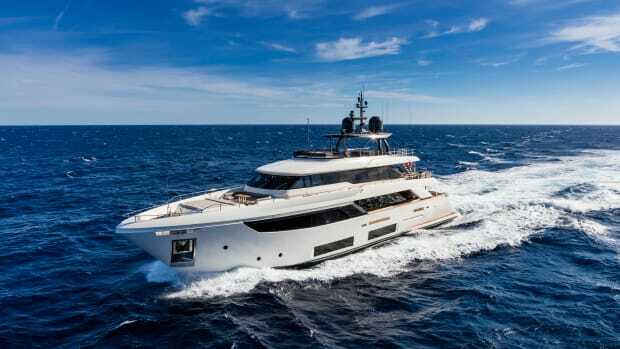 As a family boat, however, not all the spaces on board Utopia IV are aimed at the adults. One of the five guest staterooms on the lower deck serves as a toy-filled playroom for the children—and for Loren, who likes to unwind by playing with Legos and builds mini-structures for younger guests before they come on board. 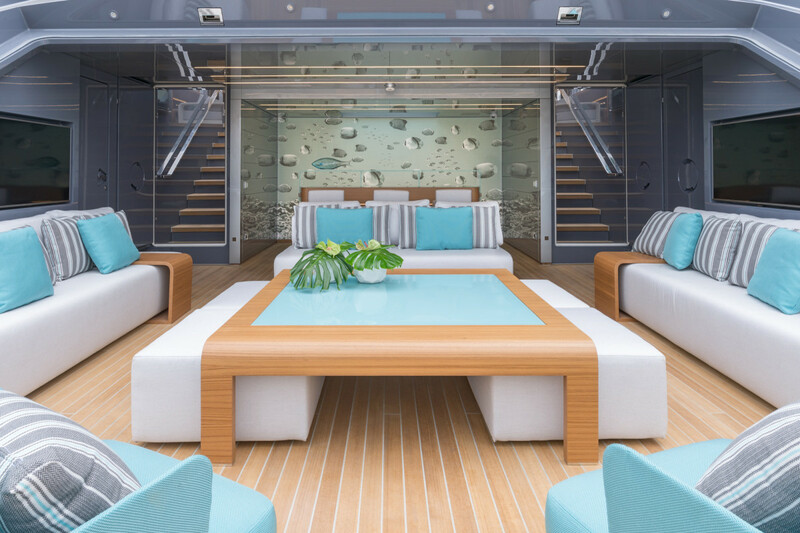 In addition to the yacht’s three child-friendly pools, the transom door folds down to create a swim platform and chill-out zone of nearly 754 square feet (70 square meters). The beach club and bar are suffused with dappled light from the glass-bottomed pool on the main deck above. 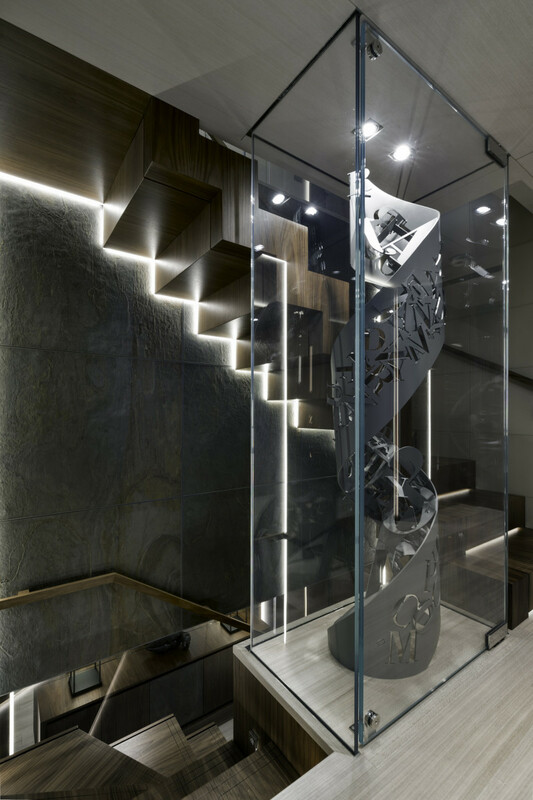 The main stairwell and pillars supporting a mirrored “magic screen” TV in the salon are clad in wafer-thin gray slate, but there is otherwise little in the way of stone finishes for a yacht built in a region famous for its marble. The reason is obvious when you consider that speed was an essential requirement, and heavy stone does not marry well with high performance. Bright splashes of aquamarine add sparkle to the beach club. JR likes his toys to be quick off the mark. He was the first person in the United States to take delivery of the new Rolls-Royce Phantom (as a Christmas present for Loren), which can accelerate from 0 to 60 miles per hour in four seconds. 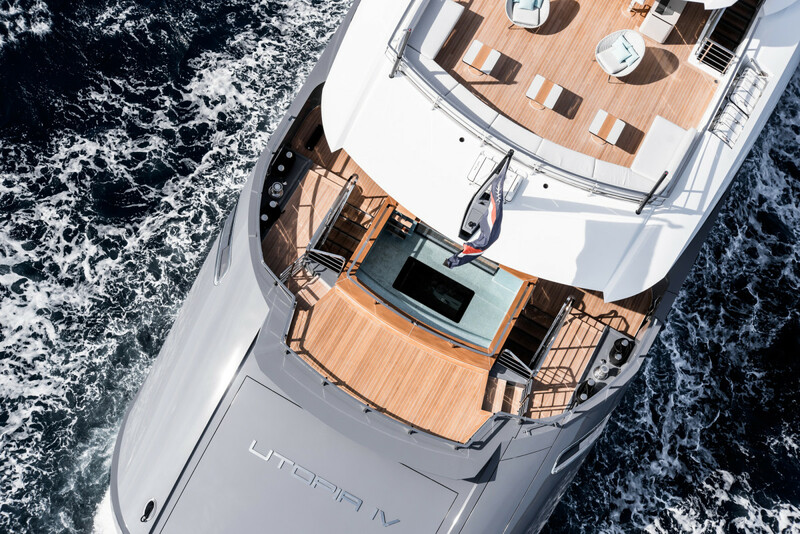 Utopia IV’s aggressive exterior styling, with her hood-like foredeck, vertical bow and low-slung superstructure, owes much to the world of automotive design. Half close your eyes, and it’s easy to transpose the white-painted coachroof onto four wheels. All that’s missing is the go-fast stripes and a GT logo on the side. 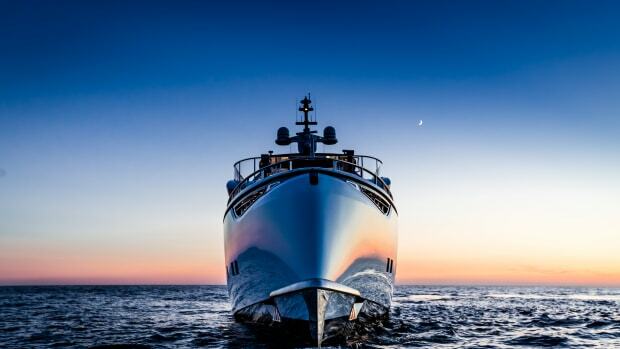 Arrabito Naval Architects developed a fast displacement hull form to meet the performance criteria. Early in the design phase, two large and one smaller engine were considered, but the team opted for four lighter, medium-powered MTUs coupled to four Rolls-Royce pump jets. Stabilizer fins, which could have compromised the speed and draft requirements, were scrapped in favor of a single inboard gyro. 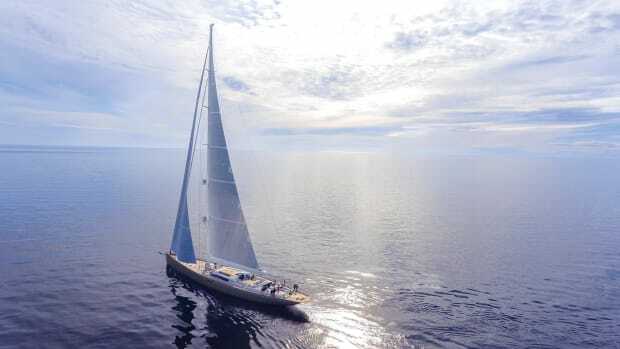 During sea trails at half load, Utopia IV notched 33 knots (exceeding her contractual top speed by 5 knots) and a cruising speed of 26 knots. 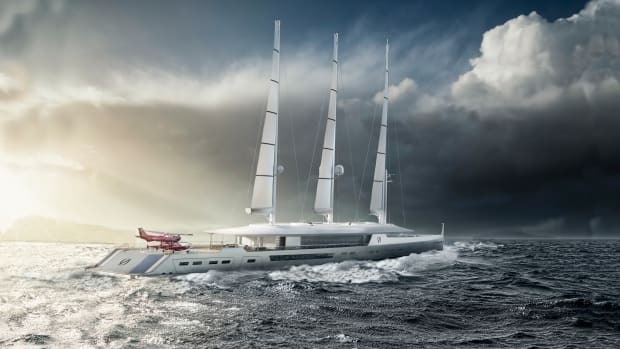 At an economical displacement speed of 12 knots, she can cover 3,300 nautical miles without refueling. The yacht has three pools. The one on the main deck aft has a glass bottom that provides a skylight into the beach club below. 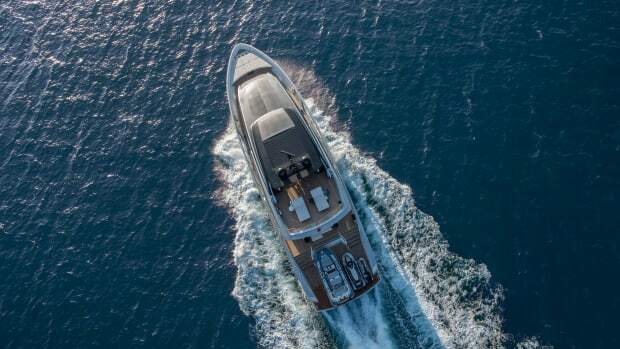 Following delivery of Utopia IV in June, the Ridingers put her performance to good use during a whirlwind Mediterranean cruise. The maiden voyage whisked them from Viareggio to Portofino in Italy, Monaco to Cannes and Saint-Tropez in France, Porto Cervo on Sardinia, and back toward mainland Italy to visit Ischia, the Bay of Naples, Pompeii, Positano, Sorrento, Capri, Civitavecchia (near Rome) and Elba. 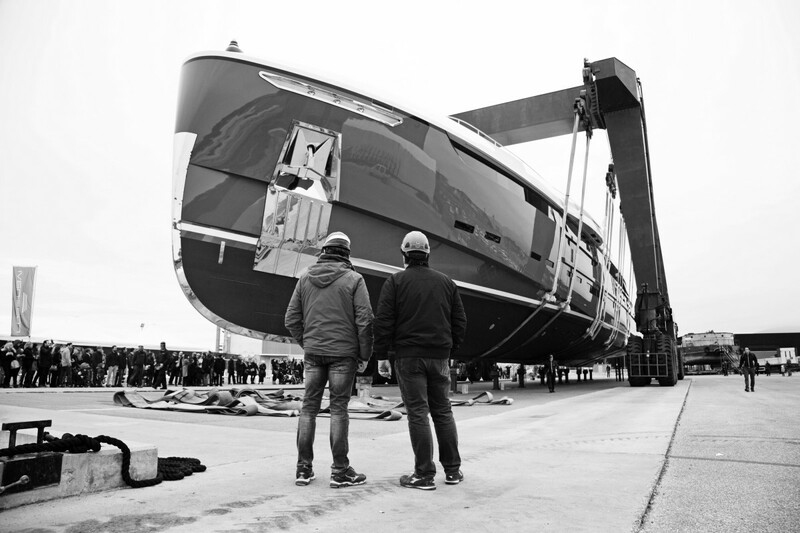 After a quick visit to the yard for warranty work, the yacht continued up the Italian coast to Genoa and was loaded onto a transport ship for the trip home to Miami and her debut at the Fort Lauderdale International Boat Show.